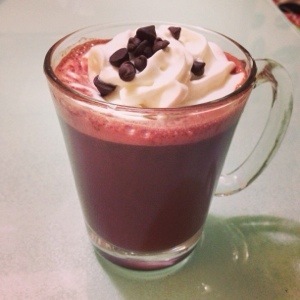 The Barista Wannabe : Red Velvet Hot Cocoa | Eating Aloud! I don’t know what is the big fuss about this Hot Cocoa. It is just Hot Cocoa, tinted red. And because of the red, let’s just give it a trendy and fabulous name, Red Velvet. Anything Red Velvet make people go nuts!